Most everybody in the computer world have this ambiance for the Mac/Apple world. And if you aren’t part of the crew, you aren’t cool. But if you really know computers, you know that: 1) Windows has been a staple for years, you’ll find cheaper prices, lots of options, 2) Mac is the elite, everything costs a pretty penny, and yes by the way, bugs still happen, and 3) Linux has made strides in the desktop OS w/ Ubuntu, but you still can never flee from those pesky driver updates and re-compiles. At the end of the day, a computer is a computer. The concepts are all the same. And as Windows was scouring the bottom of the ocean and while Mac was reaching for space and the stars. Microsoft realized that users want glossy, fashionable, and trendy. Here comes the Surface Pro 3. I took the dive on a brand new contract, being thrusted into a Mac happy world, me my SPS3 and my 2x Dell 27inch Ultrasharp’s. Wouldn’t you know, the Mac family also had a fleet of Dell 27inch Ultrasharp’s along side their Mac 27inch Ultra’s. Why? They are 50% cheaper. But lack the lust and gloss. I’ve been in the Mac world all my life, but always tended towards functionality. But maybe, just maybe, this new dig rubbed off on me a little bit. On my search for some gloss / lust in the form of a workstation, I came across the 34 inch curved displays early January, 2015. And despite the extra $150, I chose the LG 34 Curved 34UC97-S. Gloss, lust, nice curves, the whole enchilada. And after being on dual 27inch Ultra sharps for so long, it’s almost second nature, how could I not have at least 2560 x 1440?? 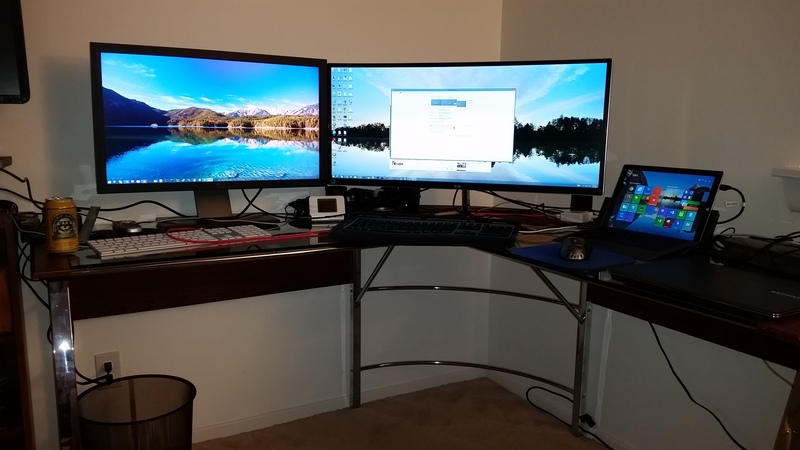 Today, playing with my monitors, I noticed the lonely Dell UltraSharp U2711 27-inch sitting next to the couch, not plugged in as it’s been replaced by the LG. So I figured, why not hook this into my Surface Pro 3 along side the LG and see if it works? People… the SP3 has some serious video processing capabilities. In just a minute, I had my LG hooked up to my SP3 docking station and the Dell hooked up to the Mini Display Port on the SP3. Microsoft is identically copying Apple’s success, and it’s pretty nice. Obviously video games don’t work to well. 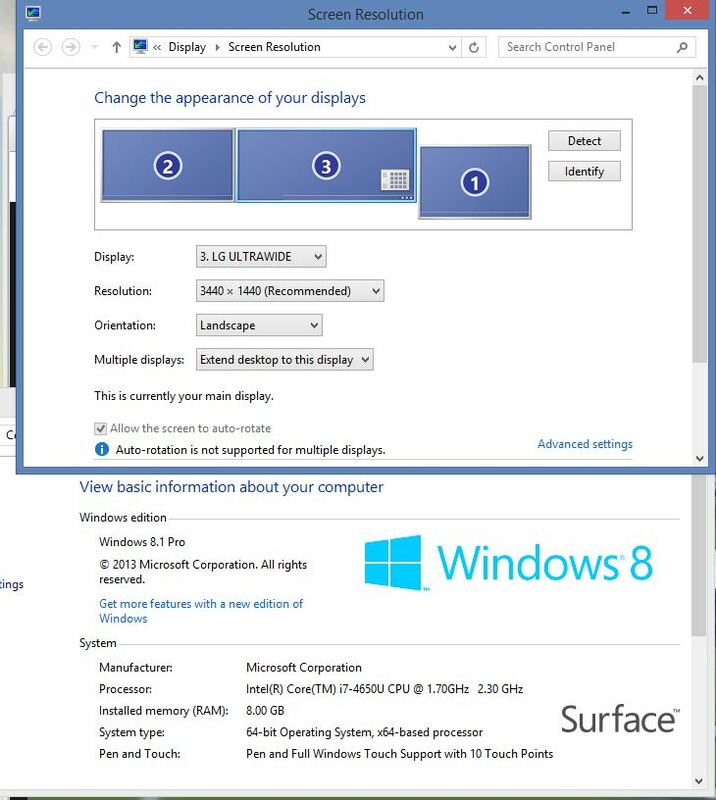 Resolution has to be dropped significantly, but Windows 8.1 does a good job identifying the primary screen. I’d say that the SP3 is a huge success and that they should continue developing this series. It can only get better.